Events in Batman Eternal #35 introduce the new world order in Gotham. 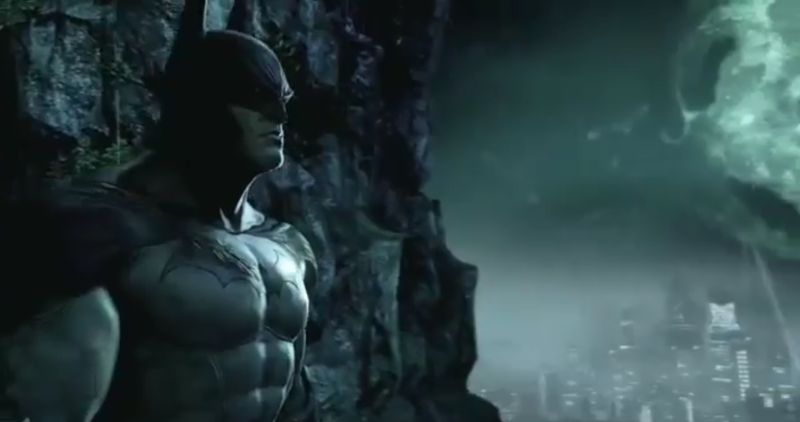 Batman confronted Hush and defeated him. 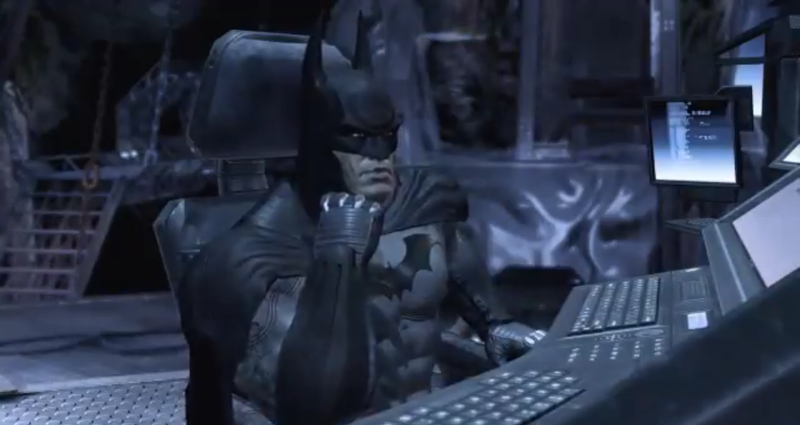 However, it was far from a decisive victory for the Dark Knight. Wayne Enterprises and its subsidiaries have been seized because of their involvement with Batman’s secret weapons caches. 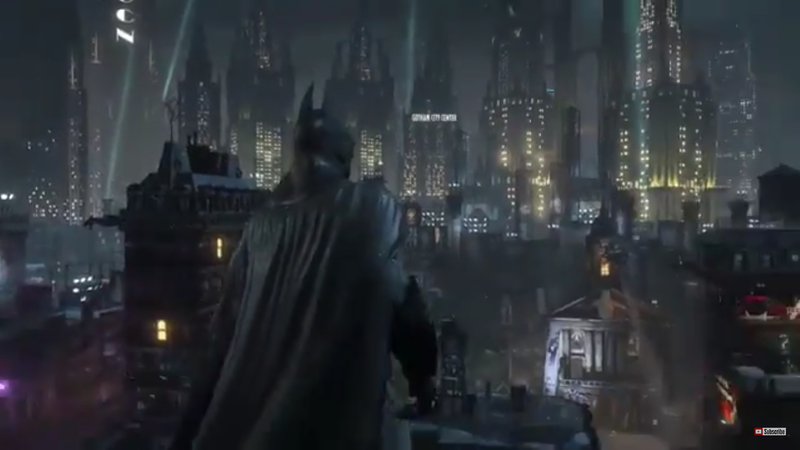 Bruce Wayne’s assets are frozen, Wayne Manor is being transformed into Arkham Manor, and now it seems that the GCPD have actually beaten Batman! 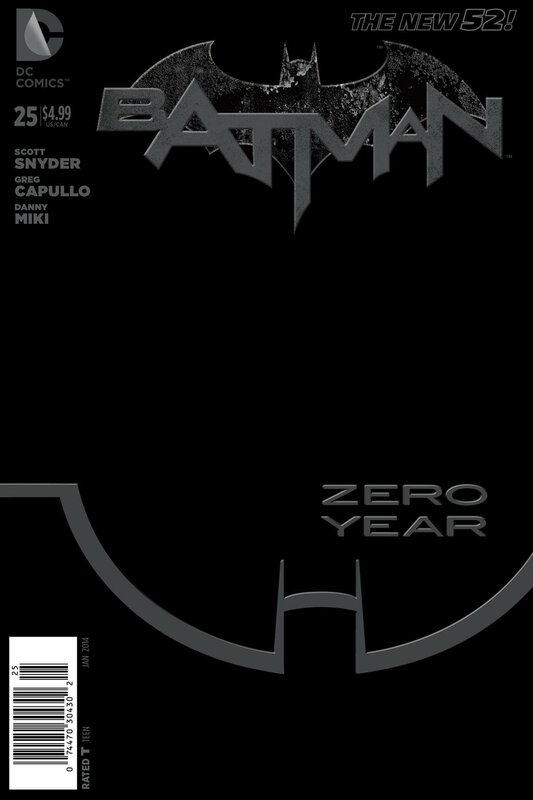 Batman Eternal #35 opens with a short flash forward to the action-packed final moments depicted on this issues cover, before detailing the events that have transpired following the fall of Hush. Out of Control begins the third act of Batman Eternal with a bang, in this fast paced story by writers Scott Snyder and James Tynion IV, with script also by James Tynion IV, and consulting writers Ray Fawkes, Kyle Higgins, and Tim Seeley, in which Lucius Fox sets out just how bad things really are for Bruce Wayne now that Wayne Enterprises has fallen and the remnants of Batman Incorporated have been raided by Commissioner Bard. 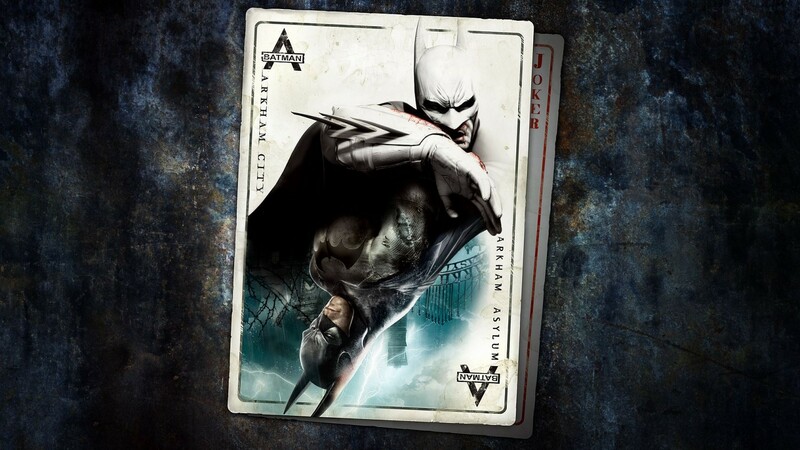 With Hush now confined in the Batcave and construction crews working on Arkham Manor, it falls to Julia Pennyworth to keep watch over their prisoner while ensuring the cave is secure until Bruce can establish a new base in the city. Meanwhile, Vicky Vale begins working on new story, one that leads her back to Bard’s old stomping ground in Detroit. 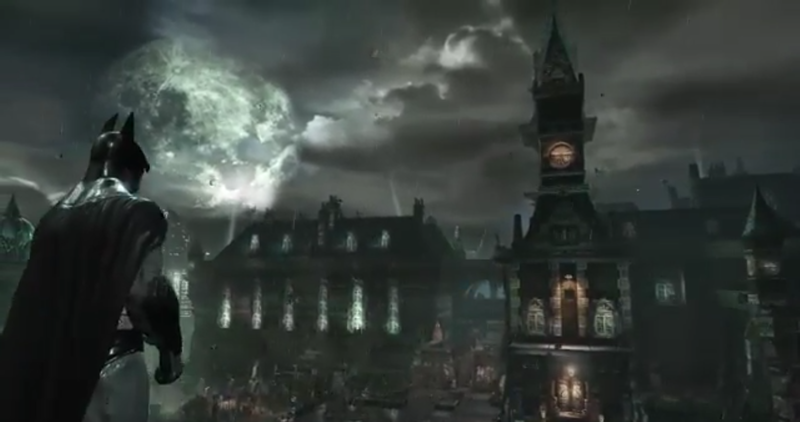 In order to draw Batman out, Commissioner Bard orders the demolition of the Wayne housing restoration project. 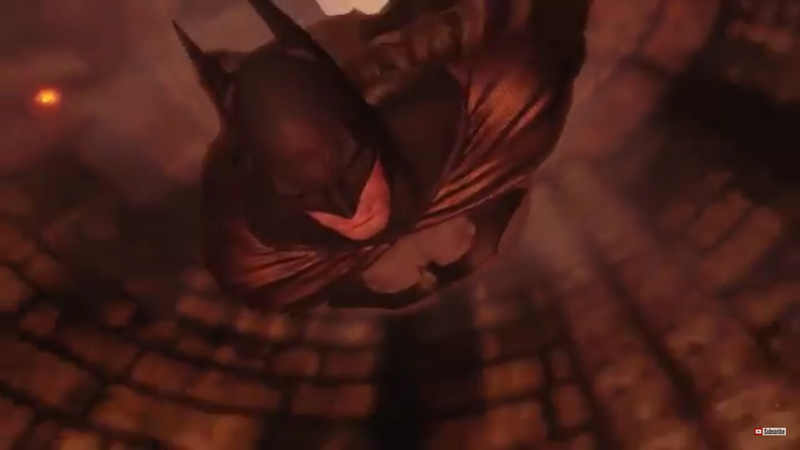 Thanks to a thinly veiled warning from Lucius Fox, Batman knows he will be driving into a trap, yet despite Julia’s warnings his attempt to force a confrontation may yet prove unfounded as Bard and the GCPD seem better prepared than the Dark Knight anticipated. The art by Fenando Blanco, with its dynamic panel layouts, really brings across the intense tone of Batman Eternal #34, and the colors by Marcelo Maiolo also complements Blanco’s work perfectly. 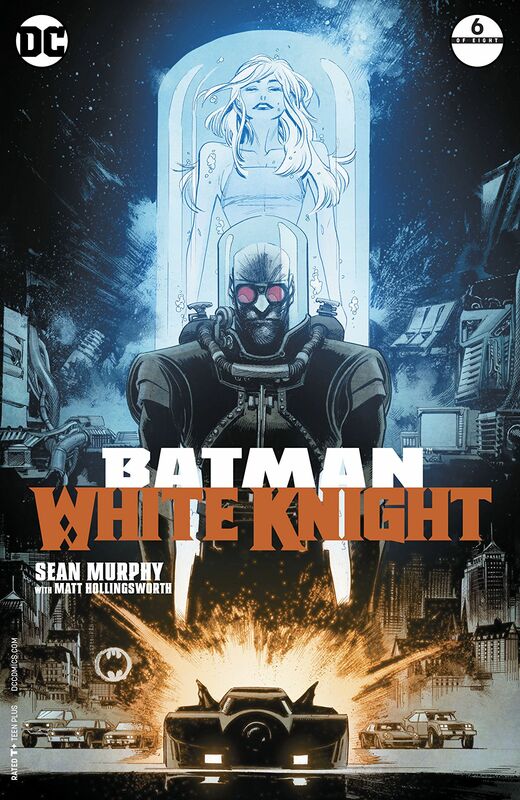 From Bruce’s initial meeting with Fox in the shadow of Wayne Tower, to the scenes in the Batcave, and the pedal to the metal excitement of the closing moments, Blanco’s richly detailed environments and Maiolo’s bold colors ensures this issue of Batman Eternal looks great and wrings every ounce of tension from the action-packed plot. 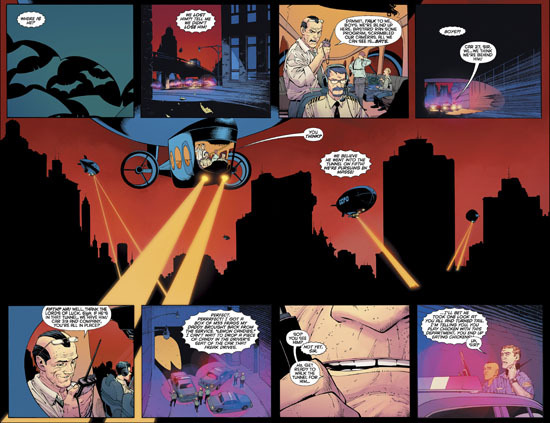 The big highlight of this issue sees Commissioner Bard doing a Batman Returns style hijack of the Batmobile, taunting the Dark Knight from the screen on the dashboard, while Batman struggles to regain control of the vehicle. 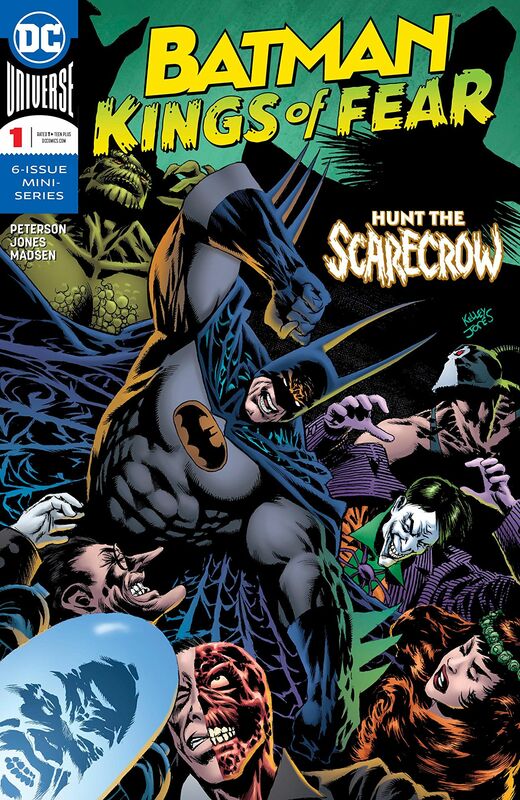 Over the exciting final pages, the net slowly closes in on Batman as the Batmobile is sent flying – quite literally – through the heart of everything Bruce’s fortune and reputation stands for before culminating in one of this weekly series most thrilling cliff-hangers to date. It is this moment, together with the startling revelations uncovered by Vicky Vale about Gotham’s new Police Commissioner, that kicks off this dark new chapter of Batman Eternal and keeps us guessing right up until the final page as Batman’s world gradually unravels around him. Batman Eternal #35 contains plenty of twists and turns in the plot to keep you hooked right from the first page, which together with its excellent artwork, makes this another thoroughly exciting and enjoyable issue of this weekly DC Comics series. Gang war breaks out in Batman Eternal #3 as Gotham City is rocked by a power struggle within the criminal underworld. 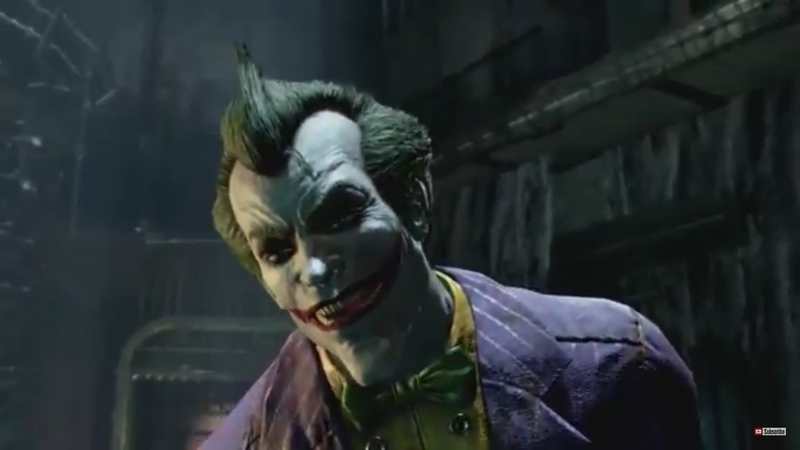 With his old friend Jim Gordon arrested for causing the train crash in the subway station, the Dark Knight continues his search for evidence to help him. 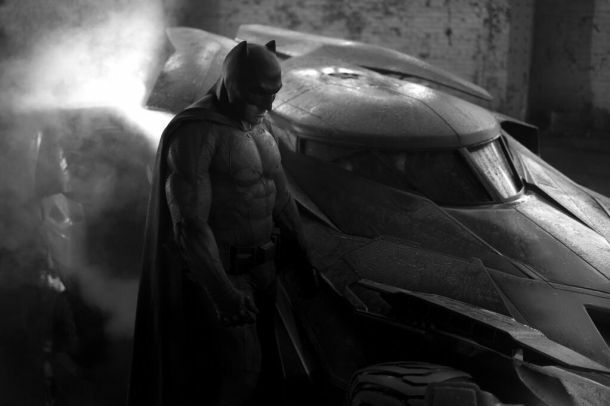 When the crime war begins GCPD seems unwilling to help Batman contain the violence. Also, get ready for the New 52 debut of Stephanie Brown! 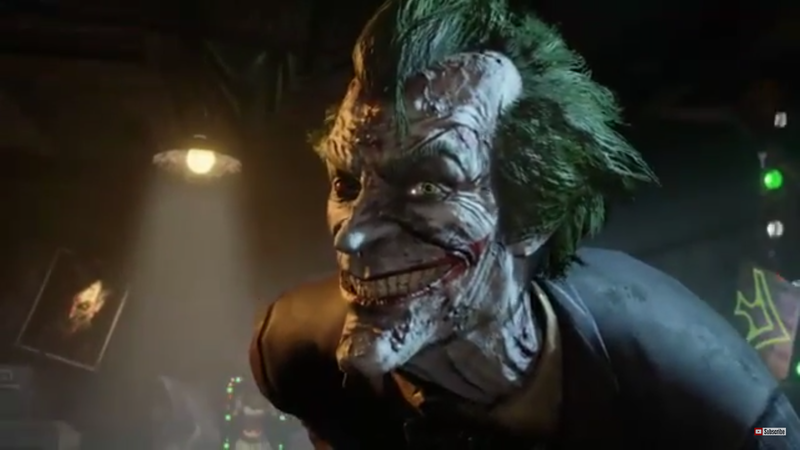 With Gordon languishing in a cell at GCPD, the situation is grim, and even Batman’s analysis of the evidence fails to offer up many new leads. The return of Carmine Falcone also spells big trouble for the Penguin; soon Gotham is reeling from an explosive outbreak of violence. 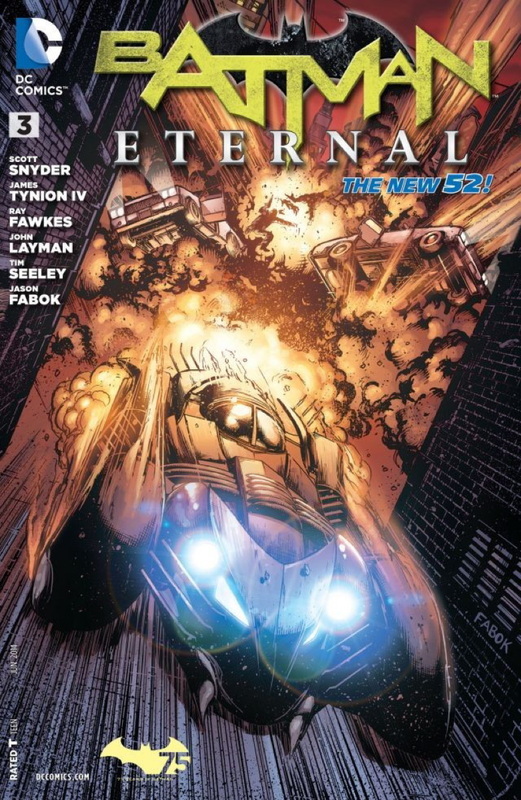 Batman Eternal #3 is a blisteringly good read, with its story and script by writers Scott Snyder and James Tynion IV (consulting writers Ray Fawkes, John Layman, and Tim Seeley) and great art by Jason Fabok, the events following the aftermath of the train crash begin to escalate dramatically. There are some great scenes at the GCPD, particularly where Lieutenant Bullock and Captain Sawyer have a heated confrontation with Forbes. Gordon’s arrest has really shaken the department to the core, tempers are frayed, and it’s not looking good for Gordon either. The responsibility for arresting Gordon is also weighing heavily on the shoulders on the new recruit Jason Bard; this certainly wasn’t how he expected his first day on the job to turn out. Bard’s conversation with Gordon in the holding cells is especially poignant, even Jim Gordon feels the evidence is stacked against him, it’s a great scene, and Scott Snyder and James Tynion IV pitch it perfectly. As the scene shifts to the Penguin at his Iceberg Casino the full implications of Falcone’s return to Gotham begins to sink in. However, there is more at stake here than just the Penguin’s empire. 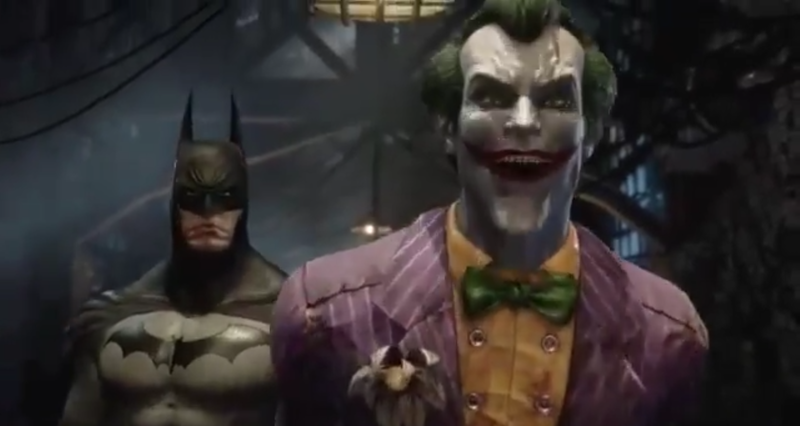 The corruption in Gotham reaches all the way to the top, as shadowy meetings begin to shift the balance of power for all concerned. Batman Eternal #3 features some terrific art by Jason Fabok, the action doesn’t let up for a moment, and with such a large cast of characters, Fabok does a terrific job, and the colors by Brad Anderson are excellent. I really like the pages in the Batcave, the attention to detail here is staggering. The moments in GCPD are also handled really well, drawing you into the story. The Batmobile adorns Fabok’s awesome cover for Batman Eternal #3 as well, and the car looks stunning in the issue too. 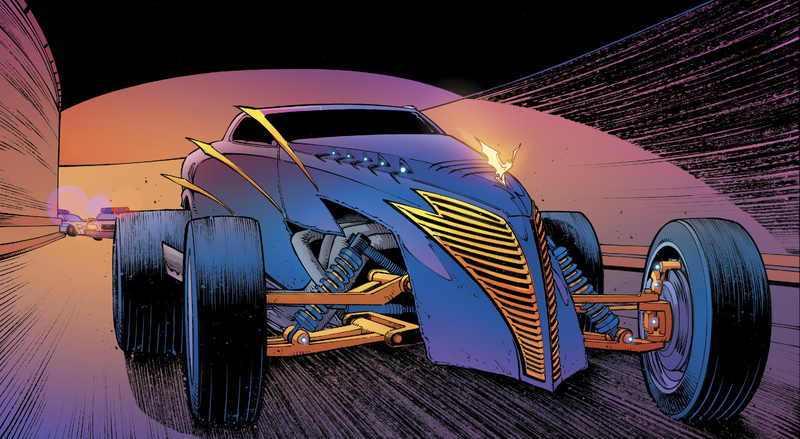 I really like this Batmobile, it’s like a pimped up version of the Tim Burton movie Batmobile, and I hope we get to see a lot more of it as Batman Eternal progresses. Batman Eternal #3 also features the long awaited debut of Stephanie Brown in the New 52 continuity. Its great to see Stephanie again, I always liked the character, and Scott Snyder and James Tynion IV make this issue a fitting introduction for her. 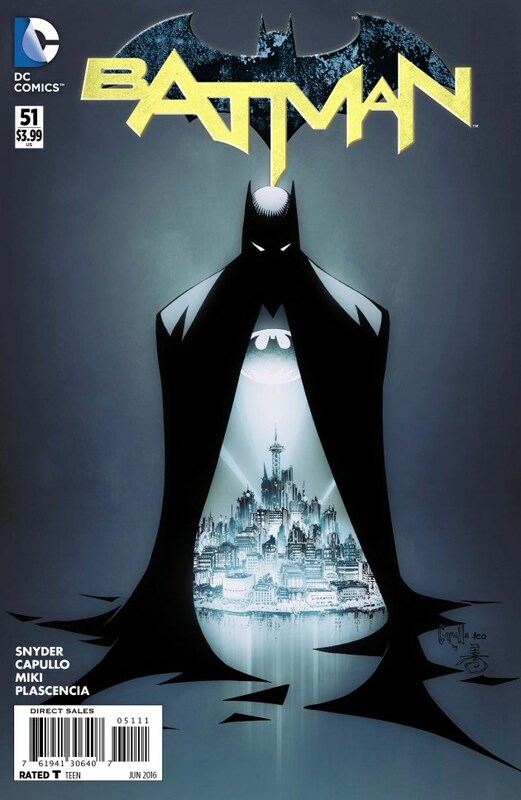 Snyder and Tynion have remained entirely faithful to the essence of the character, and they way her involvement in events also ties into the main storyline of Batman Eternal is really inspired. 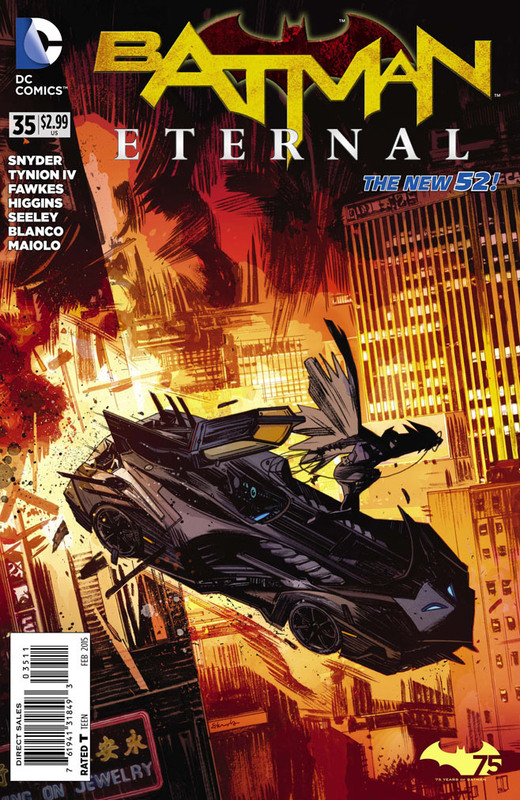 Batman Eternal #3 is another great issue in this new weekly series. With great plotting and characters, the debut of Stephanie Brown, and with all the big changes affecting the criminal underworld and GCPD, this is an issue not to be missed!